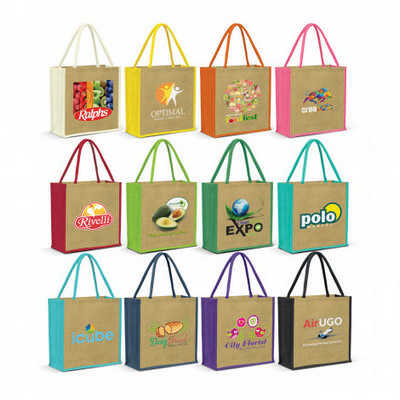 Smart laminated jute tote bag with a large gusset and padded cotton handles. It has a natural version as well as the choice of thirteen colours where the gussets and handles are dyed to match. Colours: Natural, Natural/White, Natural/Yellow, Natural/Orange, Natural/Pink, Natural/Red, Natural/Bright Green, Natural/Green, Natural/Teal, Natural/Light Blue, Natural/Royal Blue, Natural/Dark Blue, Natural/Purple, Natural/Black. Dimension: H 340mm x W 340mm x Gusset 150mm (excludes handles). Print Description: 225mm x 225mm. Print Type: Screen Print. Packing: Loose packed. Price includes : 1 Col 1 Pos Print. Setup is included.